I was lazy last week and didn't go to the grocery store so I searched my cabinets for something worth cooking. I had some leftover Alfredo sauce from Trader Joe's just hanging out in my cupboard so I decided to use it on a pizza. I made things up as I went along and it turned out pretty delicious. I used the Alfredo sauce as the pizza sauce and I used the Trader Joe's Garlic and Herb pizza dough as well. It is my favorite pizza dough of theirs followed closely by the wheat pizza dough. 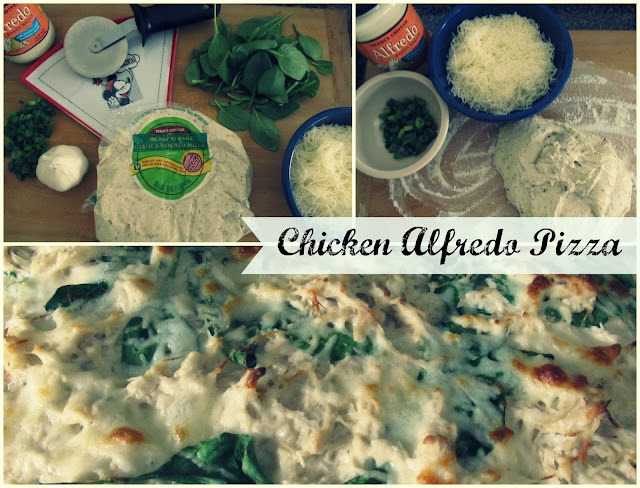 Other ingredients you need: chives, spinach, mozzarella cheese, garlic and shredded chicken (not pictured). Simply follow directions on the pizza dough package then spread with Alfredo sauce. I boiled my chicken then shredded it using the handy Kitchen aid trick. I added some Alfredo sauce to the chicken to add more flavor then spread it over the pizza dough. Then I topped my pizza with chopped chives, minced garlic, spinach and mozzarella cheese. Trader Joe's ingredients score again! YUM. Alfredo pizza is one of my favorites! My hubby loves alfredo pizza!!! Definitely have to try this. Alfredo sauce is amazing on basically EVERYTHING! Yumm! looks delicious & so flavorful! Yum!! I love their pizza dough! this looks delicious! definitely have to make this sometime!